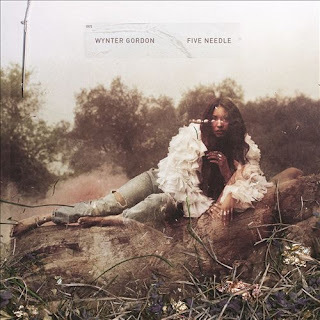 Topping my "This Makes Me Happy" list currently is Wynter Gordon's Five Needle EP -- a mixture of tunes released through Harvest Records (a division of EMI) that I definitely was not expecting from an artist like Wynter. If you're like moi and closely identify her sound with more dancey staples like "Till Death" and "Dirty Talk" (or even her Flo Rida collab "Sugar"), you might be initially thrown off by Five Needle. Typically, when an artist does a style so well, hearing she instead chooses to walk in a different direction sonically can be kind of scary for a fan. Trust and believe when I say Five Needle is worth the intrigue. Wynter shows her salt and grit as a musician with this EP and we're all better off for it. Rather than keeping herself in a genre-focused bubble of what's expected, Wynter has pulled out some serious guns (literally and figuratively) with a more introspective, intense offering. Think Sia meets balladized-Rihanna(-penned by Sia). This is most prominent in the opening track, the haunting and multi-layered "Bleeding Out" (below). The tempo is sped up a bit on "Home" but the feel is still decidedly dark. "Higher" features guitars. "World On Fire" is an epic, galloping, rallying cry that arguably sounds most familiar from her. And the set builds to its climax with my favorite of the set -- "Against The Time" -- complete with a spectacular vocal performance. I didn't see this coming but I'm so glad its here. Bravo, Wynter.